Bitten by Romance - Book reviews and more : Book promo giveaway! Guardian by Nora Weston Closed! Book promo giveaway! Guardian by Nora Weston Closed! Greetings...and thank you to Laurie for hosting this Sci-Fi adventure giveaway. 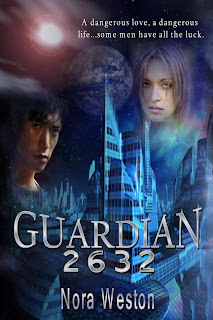 Up for grabs is a copy of Guardian 2632 by Nora Weston, from Melange Books. Like choices? One winner may choose either the e-book, print, or Kindle version. Simply leave a comment, ask a question, or even say who you’d skip through time to meet. If you love Sci-Fi, crave adventure, and must have romance in your books as well...enter the giveaway! Zane Grayson, the most accomplished executive director Guardian TMF has ever seen, is breaking the law…his law against time surfing. Zane has the supreme power, in 2632, to decide which paradoxes in time need altered, or deleted, but he’s frustrated. Something, or someone, is missing from his life. It’s possible Zane’s future is no longer in 2632...but actually in 1998. 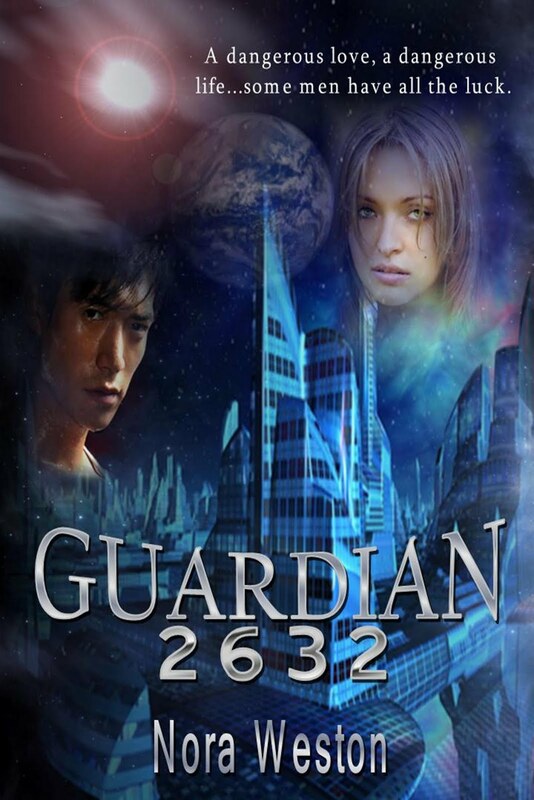 Slip through time with Zane Grayson as Guardian 2632 reveals what he will sacrifice to save a life. Nurse Carrington interrupted Zane’s conversation with Dr. Salvatore. “Doctor, excuse me, I wanted you to say goodbye to your miracle.” Smiling with immense pride that she knew the famous Doctor Zane Grayson, Nurse Carrington placed her hands on Julia’s shoulders. Zane turned around not thinking at all who might be before him, after-all, he had saved quite a few people since his arrival in Pittsburgh. “Oh…no, Julia? Not now, not today.” Zane’s blood just about crystallized. “Nurse, I’ll take it from here.” Totally freaked out, Zane wheeled Julia into his office, and then he shut the door so hard, that a few of the paintings in the hallway became askew. Nurse Carrington was left perplexed, naturally. Julia’s tears cut through Zane’s emotions like a knife as she sobbed, seemingly inconsolable. Zane wanted to defend himself wisely, yet he, at best, fumbled with his words. “Explain, explain this? Oh…wow, uh, please just listen to me.” His heart throbbed because if he blew it now, she would never trust him again. “Um, well, it was easier to do than I thought it would be. No, that’s not what I mean. I mean, I did this, that’s true, but now it seems I’ve been caught off-guard. Julia, please…just give me five minutes.” Zane gathered his thoughts staring directly into Julia’s eyes. Then he knelt down and held onto her hands. “Easier than you thought? Easy to hurt me like this?” Julia swallowed hard as she pulled her hands away from his. “Okay, that all came out wrong. Five minutes?” asked Zane. If I could slip through time I would like to meet JeanLuc Picard and help him fight the borg :) I do realize he is a fictional character, but I think if I went back in time to meet someone from history, I might change things and I don't like the idea of my causing ripples in time. Now fighting borg with hunky Star Fleet officers, I'm all for it. Thank you for the great post today and the chance to win the giveaway. I guess I'd like to skip back and talk to my grandmother more. I wish I'd taken the time to ask more about her life when she was here to tell about it. Thanks for providing a giveaway. My question to you is, "Who would YOU want to meet?" Let's say time jumping is reality and parallel universes visiting is as well - then I think I'd like to jump to different parallel universes to see if my other self in those universes made different decisions and what the outcomes are. Ok, I admit to being a Fringe TV show fan. If I win the giveaway, I'd like the print version. I am so going for a sci fi hottie here. Captain Malcolm Reynold's of the Serenity. I do miss that show. It was not around long enough. I would skip back through time and meet Jules Vern. He was an author way ahead of his time. Fighting in a battle, meeting relatives, parallel universes, and Jules Vern would all appeal to me as well, but throw in Mal as an option,and the choices become harder to choose from! Serenity is one of my favorite movies. I know Zane and Mal would get along wonderfully! Me? I'd skip through time to meet Leonardo da Vinci since I've always pondered about his personality. Did this man have a sense of humor and take joy in life, or was he serious-minded 24/7? I'd also like to speak with Edgar Allan Poe, Catherine the Great, Genghis Khan, my ancestors from Italy and Ireland, plus Claude Monet. If this is open to Canadians, count me in! Loved the excerpt and if the contest is open to Ukers then add my name to the hat please. Love the excerpt please enter me into the giveaway. Wow I LOVE sci fi! Sounds like one I would like to read asap. I would like a print copy please. Would go back to 1630's in Wethersfield, Conn to met my great-great-great... grandfather the Rev Elisha Williams as he gets off the boat from Wales. I love the idea of time skipping. I think I would probably just pick a time and observe. Too much can wrong if you mess something up. This sounds really interesting and loved the excerpt. I'd probably go back and talk to my grandparents. I'd love to skip back and talk to my great-grandparents and get some family history information. It would be awesome to speak with great grandparents and back even farther. When I hear stories about relatives I've never met...and what some of them went through to come to the states, it blows my mind! Oh, my...the stories they could tell if I jumped back to see them. I'd like to slip back to talk with my mother. I miss her. I love sci-fi... (I've spent some of each of the last 4 weekends at Star Wars weekends at Studios in Orlando, FL). This book sounds great! Thanks for the giveaway! This book sounds amazing! Thanks for the giveaway. I would love to go back an talk to my grandparents. I love time travel books. I love time travel scify I wouldn't really want to meet anyone just observe pivotal events in history and find out what caused some of them. 'Guardian 2632' looks amazing. Queen Victoria fascinates me as a figure in history. Just one of many I'd like to drop in on. i think this looks like a wonderful book! if i could skip through time, I would like to go back and meet my grandmother. I was named after her, but she passed away before I was old enough to remember her. I love the excerpt. I definitely have this one on my TRL. I too would love to go back and meet my ancestors from Ireland and Italy. How fascinating would that be. But most importantly I 'd love to go back and spend time with my late brothers and Mom.Miss them very much and would love to say "I love you "one more time. :)GFC follower under Lucky47. The giveaway has been a blast thanks to everyone's super interesting comments! The winner will be announced very soon! I hope Guardian 2632 brings you many hours of excitement as you become immersed in the world of 2632...and slip through time with Zane Grayson.